Records in Essex and elsewhere indicate the species has probably been over-looked in the past. Although males are easy enough to distinguish from other members of the aureolus group, females are difficult without dissection and reference to reliably identified specimens. Identification by the external appearance of the epigyne is unreliable. See Harvey (1991) for diagnostic characters. As with other members of the group it is essential to keep voucher specimens; it is often misidentified and any found in atypical habitat and not identified with reference to Harvey (op. cit.) are likely to be misidentifications. The species is widespread in southern and eastern England, but there are rather few records in the south-west, Wales, northern England and central Scotland. In Locket et al. (1974) the species was only known from old specimens taken at Bloxworth, Dorset, New Forest, Hampshire and Shrewsbury, Shropshire, yet by Merrett (1990) it had been recorded in ten counties mainly in southern England and also Inverness-shire. It is now known from 25 counties north to Lancashire and Inverness. The species is widespread in western and central Europe as far north as Sweden, where it is included in their Red List (Gardenfors 2000). It has not been recorded from Ireland. 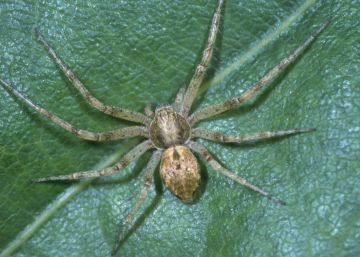 The spider is typically found on mature oak trees in open situations, in wood pasture, at the edge of woodland rides or in old hedgerows, but it has also sometimes been beaten from other trees such as Field Maple. There may sometimes be a particular association with oak branches where the foliage has been attacked and the leaves have a yellowish-green, reddish and curled appearance. Females have been found with their egg-sac in curled oak leaves. Adults of both sexes have been found between late May and the end of July with most records in June and early July. In view of our current knowledge of the distribution of this species, it cannot be considered threatened. However the majority of records are from mature oak trees in open woodland habitat, at the edge of clearings or in hedgerows. This type of habitat is threatened by lack of management resulting in the closure of open woodland, the loss of old trees and the use of pesticides on crops where old oak trees occur in land converted to arable or old hedgerows are adjacent to arable fields.